A man killed two policewomen and a bystander in the Belgian city of Liege yesterday before being shot dead in what prosecutors are treating as a terrorist attack. Police officers and forensics experts are seen at the scene of a shooting in Liege, Belgium, on May 29, 2018. A man killed two policewomen and a bystander in the Belgian city of Liege Tuesday before being shot dead in a gunbattle at a school in what prosecutors are treating as a terrorist attack. A public prosecutor told a news conference that the man attacked the policewomen from behind with a knife, described as a box-cutter by RTBF, around 10:30am on a boulevard in the center of Belgium’s third city, near the German border. “The event is classed as a terrorist incident,” Dulieu said. The national crisis center, on high alert since past attacks by Islamic State in Paris and Brussels in the past three years, said it was monitoring events but had not raised its alert level — an indication they do not expect related follow-up attacks. La Libre Belgique newspaper quoted a police source as saying the gunman shouted “Allahu Akbar” — God is greatest in Arabic. Apparently the two police officers, arms bare on what was a hot sunny morning, wearing protective vests and lying in pools of blood a couple of meters apart outside a cafe; the gunman, dressed in black, waving a pistol in each hand, standing in the middle of the road; and finally the assailant emerging from a building onto the street, firing on police, who gun him down. 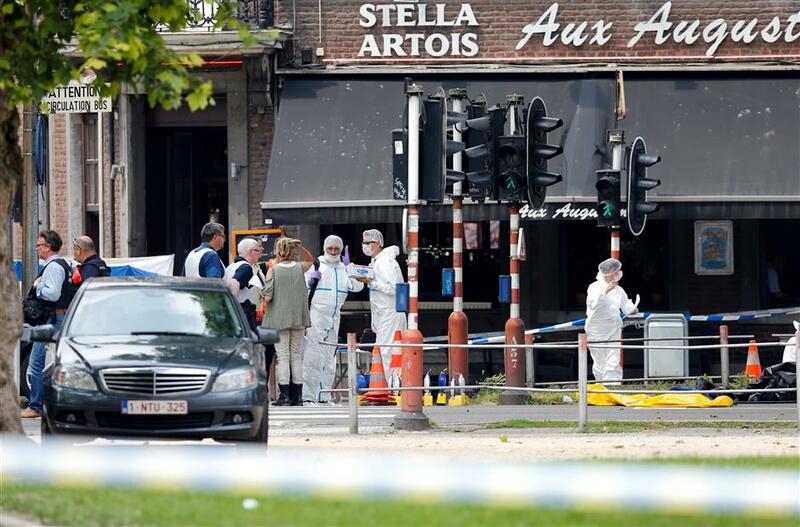 Prime Minister Charles Michel, expressing his condolences to the families of the victims, said it was too early to say what had caused the incident. King Philippe visited Liege, the biggest city in Belgium’s French-speaking Wallonia region. An industrial powerhouse on the Meuse river, it was the scene of a mass shooting in 2011, when a man killed four people and wounded over 100 others before turning his gun on himself. The Brussels IS cell had links to militants in Verviers, another industrial town close to Liege, where in early 2015 police raided a safe house and killed two men who had returned from fighting with radical Islamists in Syria.